Everyone is buzzing about Karen Thompson Walker's hot summer debut, The Age of Miracles. And the buzz is not without merit. Walker, a former editor with one of the big six, knows her stuff! The Earth's rotation is slowing. Julia, now grown, was just eleven when it all started. As she faces first love, the end of friendships, and a growing awareness of issues concerning her parents and others around her (in other words, the normal issues a girl her age faces), Julia is also facing the results of the growing catastrophe: the world is literally dying around her. People are struck by new illness, society is caving in on itself, and resources are drying up. Julia's tale is almost tragically magical. Viewing the world through the memory of a child is always an interesting way to present a story and one that I find wonderful in all of its incarnations. Here though, Walker presents a wholly believable apocalyptic scenario and a story that is completely heartfelt. Julia comes to life through Walker's crisp prose, wrapping readers up in her story. I know that each reader will take something different from the book, but I found myself tearing up at the end. In fact, I was left kind of torn to pieces by the time I finished the book. It was a truly strange and emotional experience that I enjoyed but also struggled with because while it is essentially a quick and easy read, the issues Walker brings to light are disturbing in a lot of ways. I think that The Age of Miracles is one of those books that will appeal to such a wide range of readers for so many reasons, not the least of which is Walker's wonderful ability to tell a tale. Morning, all! I am very happy to be taking part in the book tour promoting the latest International Thriller Writers anthology, Thriller 3: Love is Murder. Compiled and edited by Sandra Brown, the collection features short stories from some of the hottest romantic suspense authors out there including J.T. Ellison, Allison Brennan, Alexandra Sokoloff, Lori Armstrong and so many more. Instead of a standard tour, the Booktrib folks have put together something a little different: each stop features one of the contributing authors and an excerpt from their story. A fabulous way to give screen time to all of the wonderful folks featured in the collection. My author (drum roll) is my fellow Louisianian, Toni McGee Causey! I'm pleased as punch to be her stop. Toni is the author of one of my favorite series featuring Contraband Queen Bobbie Faye Sumrall (if you don't know, every town in Louisiana has at least one signature festival and my hometown has Contraband Days, a week of pirate themed festivities that includes the Mayor walking the plank!). And now, without further ado, here's your excerpt to whet your palate! She should not have been here. It was the worst possible scenario. He’d caught motion on his periphery—someone threading through the crowds, moving that same fluid way she did—a powerful motion that hit his senses as if a car were about to careen into him. He worked hard to not jerk around and try to find her. Instead, he sat in the folding chair on the hot sidewalk just below the oak trees and strummed another verse on the battered guitar before he turned his head, turned his supposedly blind eyes hidden behind mirrored sunglasses and scanned across the brightly lit Jackson Square in the Quarter. Toni McGee Causey is the author of the critically acclaimed and nationally bestselling “Bobbie Faye” novels—an action/caper series set in south Louisiana; the series was released in back-to-back publications, beginning with Charmed and Dangerous, Girls Just Wanna Have Guns and When a Man Loves a Weapon. While pursuing an MFA in Screenwriting as well as a Masters in Philosophy, Toni had scripts optioned by prominent studios and, just last year, produced and indie film,LA-308, which now has offers of distribution pending. Toni began her career by writing nonfiction for local newspapers, edited Baton Rouge Magazine, and sold articles to places like Redbook and Mademoiselle. She was a contributor to the anthology Do You Know What It Means To Miss New Orleans, as well as Killer Year: Stories to Die For. She has had several of her blogs syndicated nationally from the group blog, “Murderati,” and she can currently be found at “Murder She Writes.” In her other life, she and her husband are the owners of a construction company which specializes in civil construction. She and her husband reside in New Orleans. For more on Toni and her books, visit her official site here. You can also like her on Facebook and follow her on Twitter. And (as mentioned in the bio) Toni blogs over at Murder She Writes with fellow Thriller 3 contributors Allison Brennan, Lori Armstrong, Roxanne St. Claire, Laura Griffin, and Debra Webb. Big thanks to the folks at Booktrib for inviting me to participate in the Love is Murder tour. For the full list of stops and author profiles click here. And don't forget to leave me a comment below (with your email addy so I can get in touch if you win) to enter to win a copy of Thriller 3: Love is Murder. When Ellie and her partner are called uptown to an apparent suicide, they're both ready to write off the call. The vic's father is big leaguer in the music industry, though, and forces the department to treat the case as a homicide. The vic's mother is insistent that her daughter would never have killed herself, despite all evidence otherwise. Even Ellie grudgingly begins to admit that there are some things that don't quite mesh with the suicide theory. 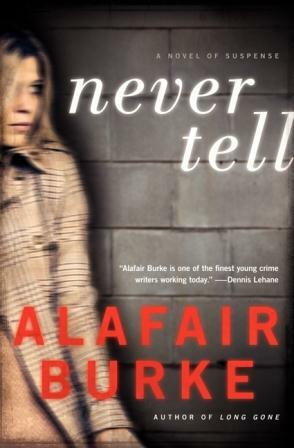 Mystery and thriller fans take note, if you're not reading Alafair Burke, you're missing out! Burke, daughter of James Lee Burke, is a master at plotting convincing mysteries with unexpected twists. I would be willing to bet that most readers (myself included) won't be able to figure out all of the threads of Never Tell before the end. I was guessing literally until the last page and loved every single second! I love that while we get a bit more of Ellie's background and relationships with each new installment, you also get to learn so much about her just through her investigations and her interactions with other characters. It makes you feel like you really know her even if you might be meeting her for the very first time. She reminds me a lot of a friend of mine (and would therefore totally be someone I'd hang out with in real life!). For more on Alafair and all of her titles, visit her website here. You can also like her on facebook and follow her on twitter. And as an added bonus, Alafair has just held her second annual Duffer Awards for Legendary Characters. The voting is over, but you can see the list of matchups and winners here. Big, big thanks to TLC for letting me participate in the tour. To see all of the tour stops, visit the TLC site for Never Tell here. I rented In Darkness this week and figured it would be a good way to kick my To See or Not to See posts off again. The movie, starring Benno Furmann, Herbert Knaup, and Robert Wieckiewicz (to name a few) and directed by Agnieszka Holland, was a 2011 Polish release about a group of Jews who are hidden away in the Lvov sewers by a local sewer worker. After digging their way down through the floor of one of the ghetto houses, a group of Jews find themselves face to face with Leopold Socha, a sewer inspector who knows the tunnels like the back of his hand. Socha could turn them in -- it's well known that the Germans are paying 500 a head for Jews -- or he can help them. One of the men, Ignacy Chiger, agrees to pay Socha if he'll guide them through when they need him. Need comes much too soon, though, when German soldiers raid the ghetto killing off anyone they come across. A small group is able to escape and an even smaller group is able to hide out under Socha's instruction. Amazingly, this story is true. Chiger's daughter, Krystyna, wrote about it in her bio The Girl in the Green Sweater, which was released in hardcover in 2008. An earlier book about the event, In the Sewers of Lvov: A Heroic Story of Survival From the Holocaust by Robert Marshall, was released in 1991. I completely missed any an all talk of this movie in spite of the fact that it was nominated for an Academy Award this year. In fact, foreign films are so poorly advertised here, it was only because I was interested in seeing what new movies Furmann (North Face, Joyeaux Noel, Anatomy) might be in that I stumbled across it at all. The fact that I might have missed it altogether is a shame really. In Darkness is well done. The story is harrowing and intense and everyone -- both cast and crew -- seems to have done such a great job telling the story. A story like that of Leopold Socha, Krystyna Chiger, and the other survivors is a testament not only of the horrors man has visited upon one another but also to human strength and is one that no one should ever be allowed to forget. I'm all about spreading the word on books and this Riffle thing intrigues me. Let's see if I can get an invite, shall we? They're calling it Pinterest for books and it's invite only at this point. Here's the piece I read this morning on PW. I guess we won't get a peek at the actual site until we get invites, but if you're interested and want to sign up yourself, here's the link to apply. Congrats, Ellisa and thanks to everyone who stopped by and entered. I hope you all have a chance to check out some of my faves this year! I'll be contacting Ellisa today to get her final pick and info. My bookmark's been meandering it's way through book three of the Song of Ice and Fire series since before I left for vacation. See, I thought that it would be the perfect beachside read -- and it's not that I was wrong, it's just that I didn't do a whole lot of beachside reading. We visited Grand Cayman this past week with mom and my siblings and had a fantastic time snorkeling, kayaking, swimming, wandering around the island, and sightseeing (we went to the turtle farm and swam with stingrays!). And so I'm not quite finished with the book -- though I'm very close. As in, I think I'll finish this afternoon. In fact, I stayed up late reading last night and would have stayed up later considering the WTF?! moment I hit with the Red Wedding, which I hear is where season 3 of the show will end. Talk about a cliffhanger there! Fortunately the book doesn't end at that point and now I'm in the aftermath and dying to get back to it. If you aren't current with the show or haven't read the books, you probably don't want to read any further. I wouldn't want to ruin it for you. The battle at King's Landing is over. The Lannisters have won... for now. Wights have attacked the Night's Watch and Jon Snow has joined Mance Rayder's ranks in hopes of learning enough to help his brothers and defend the Wall. Jaime Lannister has escaped, with Lady Catelyn's help, and is being escorted back to King's Landing where Catelyn hopes he'll be exchanged for her daughters. Arya travels to Riverrun to reunite with her family and Bran is headed North under the cover of his supposed death. Across the sea, Daenerys has gained ships but now needs and army to back her when she returns to Westeros. And though everyone has counted Stannis out of the game, he is far from done. I've got less than 1/3 left to go and Martin has already thrown in some major game changers here! I know we've all learned after book one not to get too attached to anyone in the series, but this is craziness! Each installment in the series is a big chunker of a read and every time I finish one, I'm desperate to move on to the next to find out what happens! And with season three no doubt a year out, I've got book four already lined up for my next GRRM binge. While I love the tv show, one thing that I adore about this series that's missing from the small screen is all of the intricate background and history of the Song of Ice and Fire world: the stories of Bran the Builder and the various empires that populated Westeros; the lands across the sea, of which we see very little in the show at all; the First Men; the Children of the Forest; each of the family histories that are delved into in each book... this has all become expendable (understandably) in putting together a realistic television series. But it adds such depth and richness to the books that I wish at least some of it was touched on in the show. Ah well, the fact that this epic epicness has made it to tv at all is kind of a big accomplishment and I'll take it as I can get it. Sorry to have been incommunicado these last few, folks. I've just returned from a beachy keen vacation! 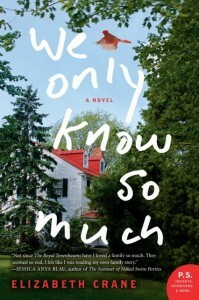 Today I'm a stop on the TLC tour for Elizabeth Crane's debut, We Only Know So Much. The Copelands are your average family, each going through a bit of a tough moment at present. Jean and Gordon have a loveless marriage, a teenage daughter whose ultimate goal is to get on tv, and a nine-year-old son who can be a bit odd (but is otherwise the most seemingly stable Copeland). They live in Gordon's grandmother's home, with said grandmother, Vivian, and Gordon's father, Theodore. Oh, and Jean's lover's dog - but no one knows that part. "Review: difficult daughter, know-it-all dad, son sweet and okay if a little weird, mom delayed potential/having affair, great grandmother bitchy, grandfather losing it. So we know where we're starting." While I had a tough time actually liking any of Crane's characters, her writing style is immensely enjoyable. Snarky is the best way to describe it, as you may notice from the quote above. I also enjoyed her use of an outside "observer" as a narrator. It added an interesting element to the story and a great unbiased look at each of the characters. Of course it could also be argued that had one character in particular been the narrator, it may have been easier to like one of them (my pick would have been Otis or Theodore). While We Only Know So Much isn't a favorite read of mine of late, I will say that I ended up liking it more than I'd expected at the outset. It is difficult to enjoy a book with characters you can't connect with - with some exceptions. Crane's got a great voice though and I'd love to check out her short story collections (I'm a bit of an evangelist for a great short story collection and I think her style is probably right up my alley). For more on Elizabeth Crane, you can visit her website here. You can also like her on Facebook and follow her on Twitter. For the complete tour schedule and stop links, visit the official TLC tour page for We Only Know So Much here. I told you guys I'd need to change it up a bit. So many dark reads in a row requires a funny sort of intermission, especially considering I'm diving into George R. R. Martin's Storm of Swords as we speak. Something is off in Alice Buckle's marriage. An email request to participate in a survey regarding marriage in the 21st century forces Alice to look back at her relationship -- what brought her and her husband together, what's happened along the way, and what might have caused this rift that's begun between them. A heartwarming look at love, relationships, and family, Wife 22 is funny and charming all the way through. I asked for light and Melanie Gideon delivered! Wife 22 was a quick and enjoyable read, perfect for summer (or any time of year) and a great diversion from my normal dark fare. Alice is super funny. She's quirky, she's appealing, she's a forty-something mother and wife who even a thirty-something (practically) newlywed with no kids can relate to and sympathize with. I liked the use of the questionnaire -- the questions are actually included in the back as an appendix, but I was able to glean most of them from Alice's responses anyway -- and that was part of the fun. Alice's facebook updates and internal notes to herself were another cute addition and kept the pace of the book quick. If you're in the mood for a thought-provoking and delightfully character-driven read, I'd definitely recommend Wife 22. What if you were one of the last people on Earth? Gene is. Gene has lived his whole life amongst vampires. His father had many rules, all of them meant to help Gene survive. Gene has to blend in and avoid notice. He has to wash frequently so he doesn't smell human. He has to be diligent about shaving and he's had to learn the mannerisms of the creatures surrounding him. And Gene is all alone. When the Ruler announces a hunt, the whole of the community is thrown into a whirlwind of activity. The Heper Institute has just a few humans left and everyone is sure this will be the last hunt ever. The hunters will be drawn by random lottery and sent to the Institute for training. After training, they'll be let loose to track and kill the remaining humans. All of Gene's efforts to blend in have been in vain. Gene's number has come up. He's one of the hunters. Now, all eyes will be on him and his father's rules will become more important than ever -- one slip and Gene could be toast. 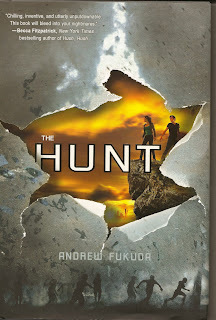 The Hunt is another wow book. Andrew Fukuda's twist on the current vampire trend makes this one a standout in teen and adult paranormals. There's no explanation as to the rise of the vampires at all. It's simply accepted that this is the reality in which Gene's world exists. It is also the first in a series, so we may learn more about the circumstances that have left humanity this way in future titles. Gene is a pretty great character. He knows that he's human but he's been so entrenched in this world that he's lost much of his own humanity. There's a conversation that takes place between Gene and his father in which Gene refers to humans as hepers and his father loses it. He tells Gene he must always refer to them as humans when they are together. Of course, this makes things kind of worse for Gene since it's one more thing he must carefully pay attention to: with dad, they're humans, with everyone else, they're hepers. The Hunt is great on so many levels. It's a story about fitting in. It's a story about families. It's a story about humanity and evils against one another. And it's all wrapped up in an excellently creative futuristic vampire package. Now, while I did jump into the physical copy about halfway through (I couldn't resist! ), I started The Hunt on audio. This one is a Macmillan Audio release and it's read by Sean Runnette. When the story began, Runnette seemed an odd choice: Gene, the narrator, is a teen and Runnette doesn't sound like a teen by any stretch of the imagination. His pacing in reading was also a bit slower than my own preference. It took about five minutes to get used to and then I was so immersed in the story that neither Runnette's voice or pacing bothered me at all. To a more seasoned audio book listener, it probably wouldn't matter, but I'm fairly new to audio books as an alternative, listening to them while I'm out walking in the evenings. I enjoyed Fukuda's book very much and thought Runnette did a wonderful job. I'm not really sure what to post today. The topic is Ask the Experts and to share personal tips about book blogging. I'm kind of stumped. I think my only advice would be to keep it fun. I, like many book bloggers, do this as a hobby. It's a way for me to get the word out about books that I enjoy and it allows me to connect to other readers who have similar tastes who can introduce me to books I might like to try as well. So whatever you have to do to keep blogging fun, do it. If that means changing it up a bit (which I'm considering doing layout and maybe even name-wise), adding new weekly topics, or whatever, do it. Never make it feel like a chore. Hm. Today we're supposed to talk about top tips for getting beyond the blog. I don't monetize, but I do write all of my primary reviews for another site. I like to think that folks like what they read there and find the blog or vice versa. I did recently join Twitter though. I was pretty against it for a while, realizing how much time I spend online already, it felt like just one more thing to add to the already long list of distractions :) But I bit the bullet earlier this year and joined up. Most of my Twitter friends are fellow book people. I've discovered new blogs and new authors and I've tried to promote my own blog further through the site. It's actually a whole lot of fun. A fun aspect about life separate from the blog... I'm a big foodie. Big. I have a huge cookbook collection that actually influenced the design of our small kitchen reno (currently ongoing). See we moved in Dec and the new house had very limited work space available on the counter. By limited (and I'm aware there's worse out there), I mean a little over a square foot of space so close to the stove top that my elbow could rest on the burner limited. Plus, the design of the house was such that you'd have to go downstairs to get to the dining table (as the previous folks had it laid out) and, sorry, I need space for my books. So we added a few prefab cabinets and an eat-in island with bookshelf supports. It's not finished, but now my cookbooks are on the shelves and I'll have plenty of space to do things like roll out dough or lay out condiments and side dishes. I'm kind of a nerd when it comes to cooking, but having no work space and constantly juggling things around has made cooking in this house not as much fun as it used to be. I'm looking forward to it being done and diving into some new recipes. I've even got a new Indian cookbook I've been waiting to try out on company. And now that we won't have to sit at the coffee table to eat, hopefully it'll be easier to have guests over for dinner. So today's topic is a positive "real life" experience with books. I feel like I have so many. I come from a town that is NEVER on author tours. In fact, the closest town that actually had author signings was about three hours away. Back in my early bookseller days (when I was still in college), Harlan Coben's Tell No One released. I had a chance to read an ARC and loved it. I mean, loved it! But very few of our customer base would really splurge on a hardcover by someone they weren't familiar with. Except one lady. She bough it thanks to my recommendation and went home and emailed Coben, telling him that she'd never heard of him but a bookseller recommended his book and she thought it was wonderful. He replied and wanted to know where she bought the book, excited that a bookseller was handselling his work. I emailed him and introduced myself. A year later, Tell No One was out in paperback. By this time, a few more of my coworkers had also read the book and it became our bookstore go to handsell. I don't remember how many copies we sold but at the time we were able to track the individual sales and they were kind of spectacular for one store! Again, Coben sent out an email just to say hi and I was able to tell him about the store rallying behind the book and the amazing sales. A few years later, the store three hours away was hosting Coben on his tour. My friend and our so's packed up and made the three hour trek to Houston to meet Coben at Murder By the Book and get our books signed. And when he learned what my email handle was, Coben remembered me! Now I live in an area that gets fabulous book signings and I make an effort to get out to as many as I can, dragging hubby when I think it's appropriate and inviting friends along. I've even had a chance to meet fellow blogger Vickie at one such event. A great book can do so many things and sharing a great book is a pretty exciting feeling. I don't have that extra oomph that I got as a bookseller, actually seeing someone buy a title I've recommended, but I think the blogging community as a way of sharing things we're passionate about is just as useful. If only one person reads my blog a year but goes out and buys at least one book they've read about here, then I've accomplished what I set out to do -- continue to share the books I enjoy and support an industry I feel strongly about. I was lucky enough to participate in World Book Night this year too. Handing out 20 copies of Stephen King's The Stand was fun and I sincerely hope that each person who received on went home and ended up staying up all night reading! Hello, Armchair BEA-ers! It's day two and the topic is giveaways and best of 2012 -- faves and BEA titles that'll hopefully become faves. The Rook by Daniel O'Malley -- a paranormal mystery of sorts that's a great blend of funny and weird sci-fi elements mixed in with a great mystery plot. Pure by Julianna Baggott -- this one is a post-apocalyptic, dystopian being cross marketed for teen and adult markets, and rightly so! I loved it. So bleak and dark and utterly unique. The Man From Primrose Lane by James Renner -- another cross-genre mystery/sci-fi read. Excellent plotting and unputdownable. I would love for every thriller fan out there to read and adore this book! Cinder by Marissa Meyer -- so much fun! A cyborg Cinderella, futuristic YA read. A wonderfully creative twist on the classic fairy tale. White Horse by Alex Adams -- another post-apocalyptic/post-outbreak read. Alex Adams's writing completely blew me away. Dark and gory but also elegant and amazing! Killing Ghost by Christopher Ransom -- this one's a cheat. I actually read this one last year when it was only available in the UK as The Haunting of James Hastings. I loved it! Ransom's twist on the classic ghost story is chilling, to say the least. This is the US reprint from Cemetery Dance that's new out this year. As for the upcoming 2012 releases, I would say the biggest BEA promoted book I'm anticipating this year is Justin Cronin's The Twelve. I zipped through The Passage and have been anxiously waiting to return to the story ever since. Chase Novak's Breed from Mulholland is also pretty high on my must have list, as is Michael Koryta's latest, The Prophet. JK Rowling's adult debut is another one that BEA is apparently buzzing about and I'm dying to see what she has in store for us with The Casual Vacancy. There are a ton of others, YA stuff like Danny Marks's Velveteen, Libba Bray's newest, The Diviners, and a whole slew of debuts. Jasper Fforde's The Last Dragonslayer is another must have on my list. Frankly, if I were at BEA, I'd be like a kid in a freaking candy store and probably just as overwhelmed by the sheer mass of titles! My wishlist is a mile long and ever expanding! The lovely Armchair BEA buttons I've been using were designed by Sarah of Puss Reboots (yesterday's button), Emily of Emily's Reading Room (today's button), and Nina of Nina Reads (sidebar button). Oh, how I wish I could attend BEA in person. But, the lovely organizers of Armchair BEA have done a great job putting together some online festivities for those of us who can't make it to NYC. My name is Becky and I'm a book junkie. I worked as a bookseller for just over six years before attending the Denver Publishing Institute. I now work in publishing, but I still love to share my thoughts and recs, so I blog and I review for Bookbitch.com. I've been blogging since 2008 and use it as a place to pimp books I enjoy. But that's pretty much what my sidebar says. Here's a bit more about me: I'm thirty (closer to thirty-one than I'd like) and have been married just over a year. My husband is a film editor who's worked on an Oscar winning documentary (he's much more interesting than I am). We spend a LOT of time reading and watching movies in our house. I have a degree in Criminal Justice (that I loved getting but am not using) and a double minor in English and Anthropology. If I could eat dinner with any author or character... that's a tough one. I think I'd like to have dinner with Stephen King, but I don't know what I'd say to him. I'd probably be all fan girly and awkward and weird. I don't think my tastes have changed much since I started blogging mainly because I've been reading such a wide variety for so long. I'd say my tastes started changing and evolving while I was a bookseller. It's easy to be more open to new authors and genres when you're so completely surrounded by a continually changing selection of them. In fact, it was only in my early reading years that I was really picky and less prone to try new things. By the time I was in high school and spending my own money on books, I started delving into all kinds of new things. The only thing to do on a lazy and ick day is read. And a great book makes the perfect companion! It's so gloomy out I've had to turn on the lights to read by, but that's ok considering I'm the midst of a really dark reading binge and currently wrapping up Gillian Flynn's Gone Girl. Grace's husband, Adam, has disappeared. He took their daughter for a walk and never returned. Grace found her baby bundled in her stroller on their doorstep and immediately knew something was wrong. One year later, she's returned to where it all happened. Grace plans to deal with their shared home but also hopes to finally find some answers. The tiny, remote village of Roseby is closed off almost to the point of being claustrophobic. Could it be that the townspeople are keeping things from Grace? I was quite impressed with this book. The plot is clever and kept me guessing pretty much to the end. Even when I'd figured out pieces of the story, I still wasn't entirely sure what was going on. The atmosphere is wonderful as well. The remote location, the chilling winter storms, and a house unfamiliar to the main character and filled with strange sounds and drafts. Deliciously creepy! It brought to mind some of my favorite gothic tinged reads, appropriate considering Grace finds a copy of Rebecca in the cottage and is reading it in parts throughout the story. Foster lives in Australia and is the author of two other titles, Come Back to Me and the upcoming Shallow Breath. If you're a fan of great psychological suspense, you'll definitely want to add Beneath the Shadows to your must read list. I'm hoping her two other titles will be available here soon as well.